General lighting, LED, warm white, DMX controlled, good dimming… All of these features are a must for the new environmentally friendly lighting CC Ter Vesten wanted to invest in. By choosing for GDS ArcSystem everything is covered. 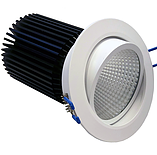 The complete installation consists of 92 Arc Pro One-Cell fixtures in a 3000K version. By controlling them with D4 Drivers, they have a complete venue lighting divided in 4 zones. “By doing this we have a state-of the art venue lighting system, giving full control to our own lighting desk, but also to all visiting desks” says Wim De Strooper, Technical Director at CC Ter Vesten. The ArcSystem Pro One-Cell Small is a compact and robust single cell enclosure ideally suited for recessed installation in areas that require subtle short to medium throw illumination. It can be fixed or adjustable by means of two axis adjustable mounting brackets, to ensure even illumination and avoid unsightly scalloping on walls and architecture. They invested in beam angles of various degrees. Not all ArcSystem lighting fixtures have their own in-built wireless receivers and power drivers. That’s where the Arc-D4 Drivers perform the important task of converting wireless (or wired) control signals into smooth, step-less dimming.